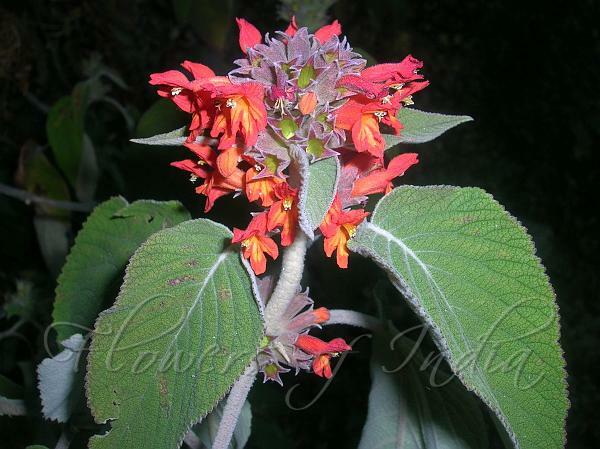 An evergreen soft-wooded shrub from the Himalayas, this grows to 3 metres. It has long, thick clusters of red tubular flowers, striped orange within, at the tips of the stems in late summer. The large, soft, tapering leaves are rough-textured, in opposite pairs and about 8-15 cm long, sometimes white woolly on the underside. 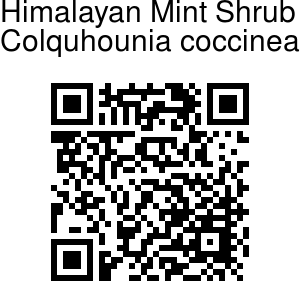 Himalayan Mint Shrub is found in the Himalayas, from Uttarakhand to SE Asia, at altitudes of 1200-3000 m. Flowering: September-October. Identification credit: Sadokpam Ranjita Photographed in Nainital & Mussoorie, Uttarakhand.